My craft blog to show my handmade cards and other handcrafted creations. Today I'm sharing my samples made using the brand new Hunkydory Prism watercolour pencils. I had such fun working with these pencils as I'd not used watercolour pencils in quite a long time, and these pencils were just a joy to use. This card uses one of the new FTLOS watercolour wonders stamp sets as well as some of the older FTLOS stamp sets for the butterflies and bees. I've used masking with one of the new watercolour wonders stamp sets to create this DL card. This card uses the FTLOS Fly Away With Me stamp set. I've used the FTLOS Up, Up and Away stamp set on this CAS card. I've stamped the FTLOS Lovely Lilies onto kraft card for this card. 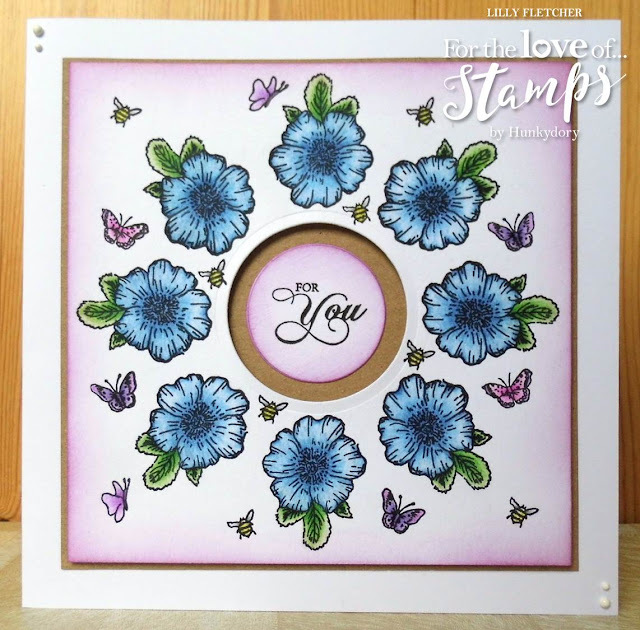 This card has been made using the FTLOS Forget Me Nots stamps and the Blossoming Blues stamp set (for the butterflies). I've heat embossed the Forget Me Not stamps onto kraft card with white embossing powder here. It's time for our new challenge to start over at Crafty Catz and this week we are anything goes with the optional theme of "colours of autumn" and we are sponsored by Lacy Sunshine. This is sadly my last week as a DT member for Crafty Catz as I am starting my university course and unfortunately won't have as much time to craft. I have used a digi stamp called Elliot and Rocco and coloured using Spectrum Noir Colourblend pencils. I simply mounted the coloured piece onto my card blank for a very simple card. It's time for our new challenge to start over at Crafty Catz, and this week we are anything goes with the optional twist of "let's do Christmas". Lee Holland Illustrations is our sponsor this week and they kindly supplied the DT with images to use. I have used the Polar Bear digi stamp and coloured the image in using Hunkydory Prism alcohol pens. The cardstock and sentiment used are both Hunkydory. I've also added in some silver mirri card and silver gemstones. It's time for our new challenge to start over at Crafty Catz, and this week we are anything goes with the option to add pearls. Rick St Dennis is our sponsor this week and they kindly supplied the DT with images to use. I have coloured the image in using Spectrum Noir Colourblend pencils. The cardstock used is Hunkydory, as is the foiled sentiment. I also used a Creative Expressions embossing folder onto white card. Today I'm sharing a congratulations card made mainly using die-cutting. I've used Sue Wilson's Grace dies for the focal element. The straight edged and scallop edged squares were both cut using Hunkydory's Moonstone nesting square dies. The corners are Die'Sire Garden Party that I cut into to make them into corners rather than a border die. The cardstock used is Creative Expressions icicle white pearl card and Hunkydory silver brushed mirri. We're back with our new challenge after our summer break over at Crafty Catz. This week I am host and our theme is anything goes with the optional theme to add a butterfly. All Dressed Up are our generous sponsors for this week and I have used the gorgeous Butterfly Wings digi stamp. We are also running our GDT call for October this week, so if you are interested then just add GDT after your name when you link up your challenge entry. I have coloured the image using Spectrum Noir Colourblend pencils and I also added some brown ink round the edges. The border die is from Die'Sire. The butterflies I have added were cut out from the paper that I've used as a strip across the centre of the card. Today I'm sharing a vintage style card that would be perfect as a male card. I do generally struggle to make men's cards (I think it's because I can't add a load of ribbon, flowers, swirls, glitter, pearls...and all those girly embellishments I love so much!) But I have to admit I did enjoy making this one. The papers, topper and embellishments are all printed off one of the Crafters Companion CD roms that come with the Crafters Inspiration magazines. I embossed one of the papers using a Crafters Companion Textures "distress" folder. I also inked some of the edges, added some shading and colour to the printed images and some faux stitching using a fine liner pen. I used some glossy accents on the clock face. I also added in some hessian for some texture. I am a keen card maker and papercrafter who uses a range of techniques in my projects, including stamping and die-cutting. I am a proud member of Hunkydory's For the Love of Stamps Design Team and Crafty Catz Challenge Design Team. I hope you enjoy looking at my creations!